This Friday, Oct. 26, 2018, photo taken by Amber Lee Alberts shows destruction on the island of Saipan, her home, after Super Typhoon Yutu swept through the Commonwealth of the Northern Mariana Islands earlier in the week. Gregorio Kilili Camacho Sablan, the commonwealth's delegate to U.S. Congress, said the territory will need significant help to recover from the storm, which he said injured several people. Military planes brought in food, water, tarps and other supplies, U.S. Federal Emergency Management Agency spokesman David Gervino said. The agency is focused on helping restore power, opening sea and airports, and ensuring cell towers can operate on emergency power until electricity returns, he said. Super Typhoon Yutu packed maximum sustained winds of 180 mph (290 kph) as it passed over the islands of Tinian and Saipan early Thursday, the National Weather Service said. By Saturday, power was still out across Saipan, the largest island with 50,000 residents, and Tinian, with 3,000, local officials said. The strongest storm to hit any part of the United States this year overturned cars, crushed small planes, ripped off roofs and killed a woman who took shelter in an abandoned building that collapsed. Others were injured, including three people who needed surgery. Jan Reyes and her family lost everything. "Everything my family and I have bought and added to our home over 13 years laid on the flooded floor as every window in our house shattered," the Saipan resident wrote in an email to The Associated Press. The ceiling of a bedroom collapsed, destroying all the furniture. A cousin was trapped under debris for seven hours, Reyes said. Her family rode out the storm in a hotel room, overturning a bed to create a barricade against the wind, rain and debris. When the worst passed, she said, it took half an hour to navigate fallen poles and trees for what would normally be a five-minute drive to their home. "However, as islanders, we value family more than anything else in this world and we are more joyful and relieved that we are still complete and safe," she said, adding that those in the U.S. territory are "resilient people." Michelle Francis hid in a closet while the storm destroyed her Saipan house, saying in a Facebook message that "many people lost their homes and their belongings. Now everyone is trying to stand strong, have faith." People in the islands are used to riding out monster storms, but many said Yutu was the worst they have experienced. "One of the things that's unique and great about the Northern Mariana Islands is because they do often have severe weather, the residents here are very resilient," said Gervino, the FEMA spokesman. "They listen to warnings from local officials, they take shelter when directed to do so, they stock up on supplies in advance of the storm." He said he's convinced that's why there weren't large amounts of injuries. The territory's only hospital, in Saipan, said it received 133 people in the emergency room Thursday, and three patients had severe injuries that needed surgery. Gregorio Kilili Camacho Sablan, the territory's delegate to Congress, said residents will need major help to recover. FEMA has a significant amount of food and water stored on nearby Guam, which was preparing for Typhoon Mangkhut last month. The damage wasn't as bad as expected, so more than 220,000 liters of water and 260,000 meals are still available for the Northern Marianas, a half-hour plane ride away. Military flights from Guam started bringing supplies Friday, Gervino said. The agency is constantly communicating with local officials on transportation, communications, food and water, and energy and fuel, Gervino said. FEMA made changes after Hurricane Maria, a Category 5 storm that struck Puerto Rico last year, creating task forces to tackle those areas. Hurricanes are spawned east of the international dateline, while typhoons develop west of it. Yutu was a Category 5 storm when it hit. Commercial flights won't be operating for some time, said Nadine Deleon Guerrero, a spokeswoman for the territory's emergency management department. Terminals, the tarmac, runway and equipment were damaged. More than 800 people were in shelters across the islands, and space was running out, officials said. 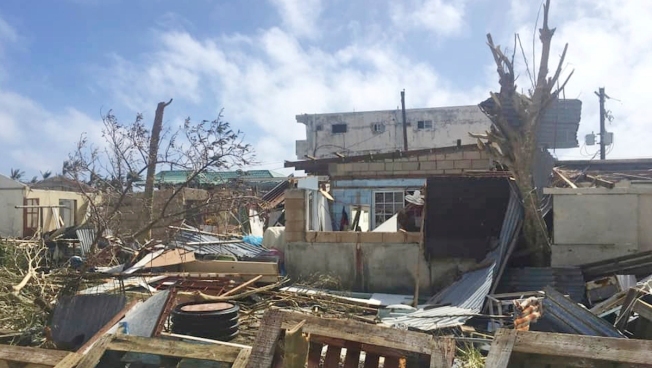 Many homes were destroyed because some poor families can't afford concrete homes that conform to building codes meant to withstand typhoon winds, said Edwin Propst, a member of the territory's House of Representatives. Some build houses with concrete foundations and walls but that have wooden and tin roofs. Even some concrete houses were reduced to rubble on the smaller island of Tinian, which took a direct hit, resident Juanita Mendiola said. Rebuilding efforts can't wait, Reyes said, though many people expect the recovery to be lengthy. "The foundation of our culture is selflessness and family values and this is what has always helped us get through hard times," she wrote. "We will always remain hopeful and prepared for the worst. This is our way of life."